I had to change a bicycle tube last week because I got a piece of glass in it. After patching it, I unknowingly pinched the tube and tore a big gash in it. I could not patch it because of the size and position of the pinch. Fortunately I had an older tube that is the wrong size, but was still in good condition. It worked for a few days, but then started loosing air. It was not a fast leak, but would be flat overnight. I decided to get another tube of the right size instead of trying to patch it. A couple of days ago I stopped into the bike shop around the corner from our house and bought a tube. I did not get a chance to install it until yesterday. I asked for a 26″ tube, but they gave me a 28″ one. Frustrating, but no big deal. I had my son take the tube back to the bike shop to exchange it. He came home again with a different tube, but it too was 28″. I have had an up and down relationship with this bike shop. While they are convenient and have fair prices, they tend to do these types of things. They have no attention to detail. My 86-year-old bicycle friend, Victor, has great respect for the man who started that bike shop. But now the shop is run by the man’s son and Victor has trouble finding anything nice to say about the shop. I would go to Victor to get my supplies, but he never lets me pay for anything. I feel like I am robbing from a good friend if I get parts from him. So I sent my son back to the shop with the second wrong tube and asked him to exchange it again. He came back with a 26″ tube. Great! Almost. It was now the wrong diameter. It was time for me to go to the shop and get the right size. Turns out they didn’t have the size tube I wanted. Wouldn’t have one for a couple of days. But they didn’t think that telling my son that information was important. I need my bike most over the weekend. Waiting until Monday was not something I could do. I asked them for my money back. He gave me most of it. I wasn’t willing to lose my temper and testimony over $1, so I let him keep that. I went to another bike shop near the house. They only sell high-end racing bike parts and did not have a tube that would fit my bike. So I went back home and put my bike together with a tube that did not fit right. This is the tube that would lose air overnight. By the way, for you bike geeks, I also rebuilt my rear hub with new cones and bearings while I was at it. Last night when I went to bed the tire was still holding air. This morning it was still well inflated. This evening it was still holding air. Is this a bike tire miracle? Though I have been tempted to abandon the local bike shop many times, I think this was the last straw. They just don’t seem to care about the customer. They only want to sell parts. If a shop doesn’t care about me, then I have trouble caring about them. In contrast, the hardware store near the bike shop has all my respect and business. One time I was in there and they didn’t have enough change for me. They told me I could pay them the next time I was in, even if it took a few days. A couple of weeks ago I sent my son to buy some nuts, bolts and washers. Because I only needed 5 of each, they gave them to my son for free. While I can easily pay $3 for the hardware I need, they are a business that understands $3 is a small price to pay to have a loyal and faithful customer. The next closest place I know about to buy tires, tubes and parts for my bike is about 3 miles away. Even though they are further away, I have always gotten exactly what I asked for. I guess they will get more of my business in the future. Author dpeachPosted on April 30, 2011 Categories Bike, SalesmenTags bicycle, bike, customer service, service, tire, tube3 Comments on A Bicycle Tire Miracle? Darren over at Bicycle Touring Pro has a scholarship in which he helps young bike tourists get started with their dreams of bike travel. He does this with cash gifts as well as equipment donations. This month he is donating 100% of the profits he makes from his bike touring related ebooks to the scholarship. This offer good from now until April 24th. On the 25th he is planning to distribute the money to the applicants that get accepted to the program. 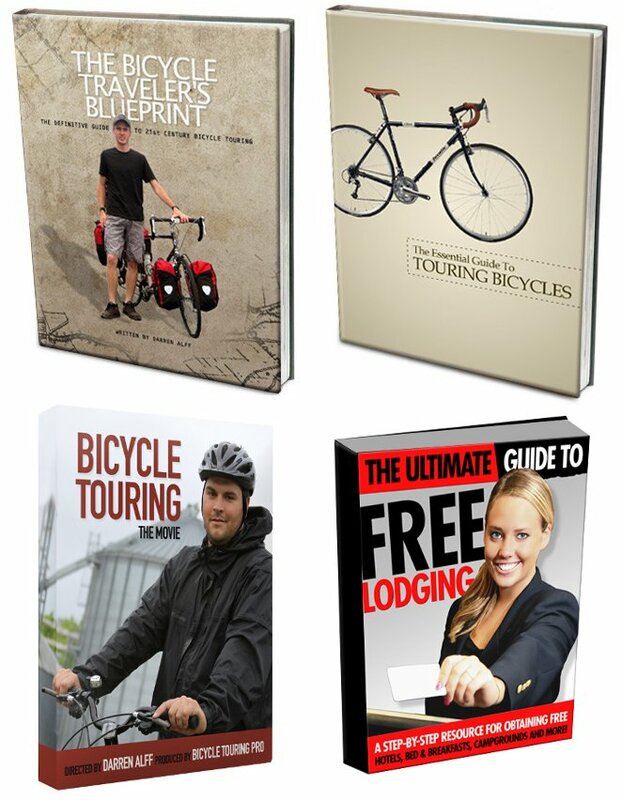 Therefore, if you were considering buying one of Darren’s books, The Bicycle Traveler’s Blueprint, The Essential Guide to Touring Bicycles or The Ultimate Guide to Free Lodging, now is the time to do it. He also has a video he has put out which contains much of the same information. As someone who is interested in bike travel myself, I am excited to help Darren promote his books. Especially since I know the profits will help new bike travelers. I am more than twice as old as some of his applicants, therefore I don’t qualify for the program. But I can help out those who do qualify. This morning I started the day by getting up a few minutes late. I rarely sleep past 7:30 without an alarm, but today I managed to stay in bed till my wife kicked me and told me it was 8:00. Even though it is Saturday, I had a busy morning planned. After a quick shower I headed out the door to distribute church tracts at my neighbors’ houses. Then back home for a quick breakfast. I have a sign language class on Saturday morning that I attend. That is about a 4 mile bike ride from home. Going to class was the end of my “normal” Saturday. Today the men at church had a picnic planned at one of the member’s house. We do this once a month or so, but this was the first time that it was complicated by me having to go to class before the picnic. Because of class I would miss the bus which took everyone else to the picnic. I decided that I would ride my bike several miles away from town into the country to the picnic area. It was about a 10 mile bike ride from my class to where the men were. Most of the ride was in pretty heavy traffic, which is what I am used to. We had a good time at the picnic. As typical, the vast majority of the men played soccer for a few hours and shoved food in their mouths when not playing. Someone brought a football (a real one) and we tossed it around a bit. One of the men talked about how football was a sissy sport. Another missionary commenced to taking on anyone who dared to try to tackle him American Football style. No one came close to getting him on the ground, though they all regretted trying. My bike trip home was much shorter since I could go the back roads to get to my house. However, I didn’t know how primitive these roads would be. The man who lived out there told me that a bike should be able to ride on the road pretty well, but a car shouldn’t try that route. In the end, almost 5 of the 7 miles were dirt roads. Four of those miles had more horse tracks than car tracks. The road was so little traveled that there was grass growing in the ruts. If I could ride my bike across the country on such quiet peaceful roads, I would give up my car and live with just a bike. Oh, wait. I already have. Last week I celebrated 41 years of life on this planet. I wanted to celebrate by riding 41 Km on my bike. The final result was a 43.7 Km ride (even though this map shows further (the map is stupid)). I rode from our house in Gonnet to Ensenada up by the river. I have never been to Rio de la Plata before. The river is just 5 miles “as the crow flies” from the house, but by way of roads the shortest route is about 9 miles. A 41 Km ride (about 25 miles) sounded like a great time to visit the river. From Ensenada I rode out to Punta Lara taking a road along the coast. It is not a very pretty coast, but the river is so large that it looks like an ocean coast. The next closest point of land is 25 miles across to Uruguay. Maybe if I practice my swimming enough then next year I can swim 42 Km to the other side. When I was going out to the northwest along the coast, I noticed the wind was strong in my face. But I didn’t realize how strong it was until I reached my turn around point and started coming back. As soon as I turned around I immediately went into my highest gear and didn’t slow down until I had to turn off the coast road and started heading back down to La Plata. 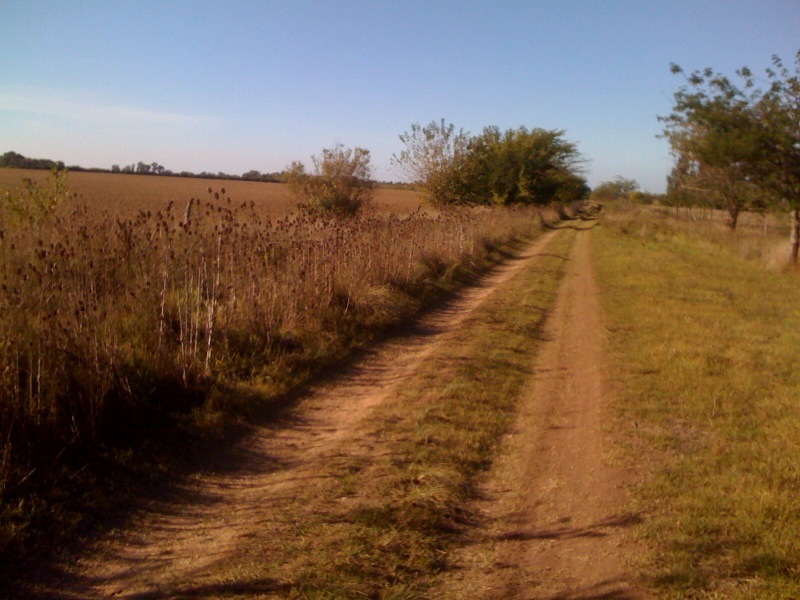 The main highway connecting Punta Lara with La Plata is a divided highway that is straight and flat. Actually a very nice road to ride on. It is concrete and mostly smooth. I was impressed by how few cars were on the road. However, in the video below you actually see a couple of cars and a motorcycle. That was a rare few moments on my ride down that road. I probably only saw 2 other cars the whole time. When I got back to La Plata I discovered why. There were protests going on (for what reason I never found out) and the protesters were blocking the road. No one coming from La Plata to the river could drive up the road. I assume that the lack of traffic going my way was because anyone who had come from La Plata knew that it was blocked going up, so they did not return that way. When I got back into La Plata, the main road going around the city was blocked by another protest group. I had to take a couple of detours from my intended route to make it back home. That is where I added on the extra distance to my ride that I had not planned. However, because of the change in route, I was not sure if I had gone longer, shorter or about the same. So I added a little bit extra to the ride at the end. My stats were 43.72 Km in 2:18:04. My average speed was 11.81 MPH. That isn’t too bad considering I am on a mountain bike and not a road bike. I also did not stop the clock when I pulled over at a store and bought some water and peanuts. I also stopped for a bit to take pictures of a strange sight. There was a tractor sitting by the river’s edge. It had a boat trailer connected like it had just delivered a boat to the water. It was a fun ride. I need to do some more long rides like that again. I want to do a bike tour, but I need to find some time to take a couple of days off and decide where I want to go. I was thinking that if I could couple a 3 or 4 day trip with an opportunity to visit another church that would be great. UPDATE: This sale has been extended to at least the end of 2010! Be sure to take advantage of the opportunity to grab these great resources. I have read most of the information available in these books. Still working through 1 more. If you are looking for some good reading about bike touring, then check out Bicycle Touring Pro’s Black Friday special. For four days Darren is offering all of his digital products for a package price of $47. Normally these would cost you $85 if bought individually. I have read The Essential Guide to Touring Bicycles and can tell you there is a lot of good information available in the products Darren writes. I am looking forward to reading/watching the rest. In the left sidebar you see a banner ad for The Bicycle Traveler’s Blueprint. You can use that link, but it is for the full price of the book. Instead, use the links in this post to get you the 4 package deal of only $47. This special starts November 25 (US Thanksgiving) and goes through Sunday November 28, 2010.